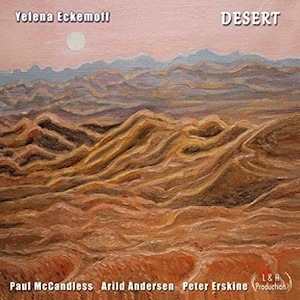 Personnel - Yelena Eckemoff: piano; Paul McCandless: oboe, English horn, soprano sax, bass clarinet; Arild Andersen: bass; Peter Erskine: drums, percussion. It is amazing how the desert can be so intensely vivid and musically inspiring. Anouar Brahem, Zakir Hussain, and Rabih Abou-Khalil often invoked it in their respective world-fusion styles. Now is the Russian-born, North Carolina-based pianist Yelena Eckemoff, who musically describes those vast landscapes of yellow sand, starry blue skies, and orange sunsets. For that purpose, she convened three world-class musicians - multi-reedist Paul McCandless, bassist Arild Andersen, and drummer Peter Erskine - and invites us to take a trip with them into the exuberant world of the Arabian sultans. “Bedouins” carries a bass groove impossible to resist, beautifully meshed with an elegant propulsive drumming to attain a lush foundation. When not accompanying with sparse and tasteful processional chords, Eckemoff improvises with a bold sense of tempo. McCandless plunges headfirst in malleable melodic stretches, whereas Erskine controls the tom-tom attacks with a brilliant touch. I would swear I saw a caravan of camels passing by. All this velvety, intensity, and freedom are transferred to the next piece, “Mirages”, which soothes the spirit with idyllic passages initially introduced by a minimal one-note piano ostinato. The song is sonically expanded, gaining a strange and urgent force through the inventiveness of McCandless, whose atonal expeditions traverses jazz vanguardism. Eckemoff’s piano work is encouraging, making successive bass notes dancing in contrast with the delicious sweeping movements of the right hand. After the storm comes a calm, yet, not devoid of a giddy sense of adventure. The musing literacy of the 3/4-metered “Desert’s Cry” bridges jazz fluency and non-Western spirituality in an attractive ethnic fusion. A similar tempo and mood characterize “Sands”, which closes out the album. The classical background of the bandleader is strongly felt on both “Dance” and “Condor”. However, the tunes display distinct qualities. If the latter is deeply explorative in its jazz-classical hybridity, the former is a percussive charmer, churning a settled mix of ideas that include sax-bass unisons and expressive solos over jazz harmonic progressions. The cumulative wisdom of the musicians simmers well throughout this enticing conceptual album, serving to translate complex compositions into traveler songs of sheer beauty and apparent facility. Other good examples are the breezy “Oasis”, rhythmically driven by brushes and featuring a gallant bass solo; “Dust Storm”, a modal jazz inflection marked by the disparate tonalities of McCandless oboe and bass clarinet; and “Garden of Eden”, a softly introspective piece with a folk melody and fugue-like piano movements. Never too smooth, never too aggressive, the album offers the possibility and the pleasure of discovering new places. The classy compositions presented here conjure up the great mystic of the desert. The music feels like finding a precious oasis.